Standing on the lip of the canyon wall, Malcolm Seawell did a last minute check of his harness, then leaned back over the edge, letting the climbing ropes take the strain as gravity fought for control of his body. This was always one of his favourite moments in any climbing adventure, second only to the triumph of a successful ascent that would invariably see him resting for some time at the top, drinking tea and savouring the moment as he surveyed the landscape below stretching off to the horizon. In stark contrast to the effort of getting to the top, the descent was gravy, usually a quick and methodical series of rappels that would take him to the bottom in a fraction of the time it took to climb to the top. Light and agile, Malcolm relished the efficiency of heading back down, feeling almost weightless as the rope fed through the figure 8 in his left hand, his right hand held tightly against his waist, maintaining an even strain on the rope as he effortlessly hopped from ledge to ledge, braking ever so slightly to lessen the impact of each touchdown. As he was about to go over the edge, Malcolm smiled to himself as he remembered his climbing partners ribbing him about his slight frame and wiry build. “One hundred and forty pounds, soaking wet,” they would say. “Carried packs almost as heavy,” they’d add with a laugh. “I suppose you did,” Malcolm would reply. There was no lack of bravado or ego in the climbing community, he thought. Everyone was all about me. But over the years he’d been lucky. He had a long list of former climbing partners who shared some of his greatest climbing achievements, men and women both, who had finally given up as age, injuries or more serious mishaps caught up to them. Remarkably, Malcolm had climbed for more than forty years, most of it injury free. He’d avoided major mishaps, but like everyone in the climbing community, he knew many who hadn’t been so lucky. Climbing had taken its toll, so much so, that his wife still couldn’t fathom why he continued to do it when a number of his best friends were now gone. She just didn’t get it. For as long as they’d been together, Marion had never really taken to climbing. So while Malcolm packed ropes, harnesses and hardware and headed out for a day of climbing, Marion often took the canoe and went exploring. Together they amassed an almost encyclopedic knowledge of one passion they shared: Jasper National Park. 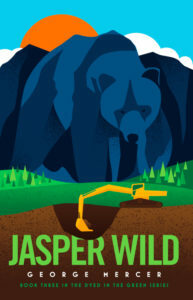 But increasingly they were concerned about the park’s future, doggedly following up on any rumours of a new development or expanded human use, convinced these were eroding the very principles national parks were based on and eating away at wilderness. Together they’d become a burr in the side of Parks management, unwilling to concede one more inch of the park to developers or the latest fad, and always on the lookout for something amiss in Jasper. Even earlier in the week, it had happened again: while Marion was away visiting their daughter, Malcolm had come across flagging tape in the Maligne Valley. Following it he was surprised to find what he thought was a survey stake, but its location made no sense, practically sitting in the middle of nowhere, some distance from the Maligne road, and not near any of the trails in the area. A quick call to the park’s office had done nothing to satisfy his curiosity and once again he’d been handed off to a junior park planner, who told Malcolm he’d check into it and get back to him. Brushed off yet again, Malcolm thought. And when he went back to check, the tape was gone. Despite spending several hours searching, he was unable to find the stake again. To jog his own memory to investigate further, Malcolm left a note of sorts stuck to the refrigerator, a cryptic scribble typical of his many notes to himself, which he often had to reread multiple times to decipher his own words. He was getting older, after all. The thought brought another smile to his face as Malcolm angled out from the ledge, leaning back and stepping down the rock wall until the rope settled against the edge. Flexing his knees and pushing off, he hung in midair for a split second before dropping down the wall, taking his time to ensure the descent was smooth, trying to avoid rubbing the top rope against the rock’s abrasive surfaces. Ever the miser, today he was using some of his old equipment, wringing the last pitches from some old ropes before cutting them into shorter lengths for canoe tie downs or tent ropes, whatever he needed. As he lowered himself Malcolm sensed movement on the rope and paused for a moment to look skyward. Seeing nothing at the top of the ledge, he looked past the canopy of fir into the bands of clouds sliding quickly across the afternoon sky, then relaxed his grip and continued his descent. But once again, Malcolm sensed something wasn’t right. Ever so subtly his grip tightened. Suddenly he brought up with a lurch, suspended above the canyon floor as the weight of his body swung him toward the wall. Just as quickly he heard a sharp crack from above and instinctively lowered his head and braced for impact. The falling rock caught him on the edge of his helmet, glancing off the hard plastic and plummeting to the canyon floor. Momentarily stunned, Malcolm’s grip loosened as a small torrent of stone shards dislodged by the larger rock stabbed into the back of his bare hands, sending the climbing rope speeding through the figure 8. Reacting more than thinking, Malcolm clawed the air for purchase, but to no avail. With a muffled cry he plummeted to the bottom of the rock wall, landing with a sickening thud on the canyon floor.